ChiQui Beaute Skin Care - Chenni Wen - Blog. Don't have time to take care of your skin? Tired of using so many different products every single day? 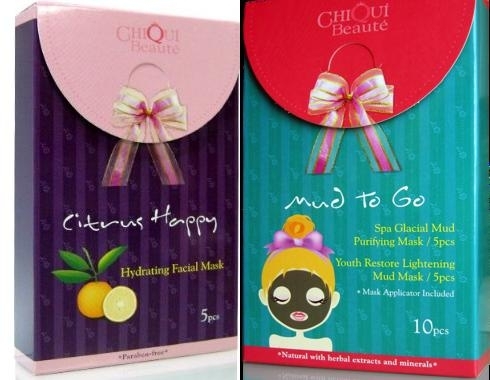 ChiQui Beaute Facial Mask is here to save you! All you need is 15~20 minutes of your time once or twice a week. Then you can have beautiful skin all week long. The Citrus Happy mask helps with dry skin. It hydrates and moisturizes. Great for all skin types. Relaxes the physical and emotional tension in your skin through Citrus Aromatherapy for a stress-free, at home spa session. The Mud To Go mask comes in two different kinds. Purifying and Lightening. The purifying is my favorite. It get rid of blackheads. You don’t even have to put it all on your face, it could just be on your nose. It works really well. Giving you a fresh feeling afterward. The lightening mask basically get rid of dark spots. Darkness that shouldn’t be there. You could even order a sample from them just to try it out.